Third dates have made me twitching nervous since I was a teen, and I figure I’ll still be fidgeting like this outside the retirement home, waiting for some wispy-haired Romeo to pick me up in his electric golf cart. Dinner. Movie. And this particular event, which would start in seven minutes, could be the culmination of my first foray into online dating. After a couple of fun, if less-than-romantic, meetings with other friendly respondents, this guy—let’s call him Mohammed—walked into the coffee shop. Oddly, he hadn’t sent me a photo (or asked for mine), so I sort of expected him to have a terrible complexion, or a hairlip, or maybe some kind of palsy—not that there’s anything wrong with that. But this guy, the funny one, turned out to be so handsome that I had a hard time looking right at him, with creamy skin, big brown eyes and expressive hands that mesmerized me as they maneuvered deft and certain across the backgammon board. My personal ad had requested two things—that potential suitors play backgammon and be well-traveled. Mohammed had moved here all the way from the Middle East—right before 9/11, no less—and was therefore in the top three replies by distance, number one for potentially interesting stories. I hadn’t really expected him to make it to Date Three, however. (My money had been on the Peace Corps cutie who’d lived in the Brazilian Amazon, but then he turned out to be 13 years younger than me, which is technically legal but still a little weird.) There he was, though, right outside in his dark green, late-model Audi sedan with leather seats and phenomenal pick-up. “The V8 engine would have cost a lot more,” Mohammed explained wistfully during Date Two. But he had considered it. Dinner was a little intense. Maybe he was already in a bad mood. We hadn’t yet discussed much in the way of politics, perhaps (I hoped) because he wanted to get laid, and in today’s cultural context that could alienate potential bedfellows. Tonight, however, he was grouching about everything, including the breaking headline news that Al’Qaeda and Hezbollah were working together. 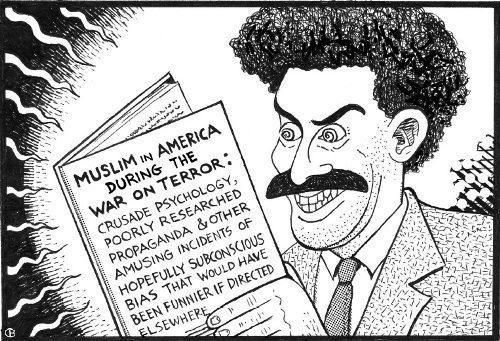 Another book I’d like to read: Muslim in America During the War on Terror: Crusade Psychology, Poorly Researched Propaganda and Other Amusing Incidents of Hopefully Subconscious Bias That Would Have Been Funnier If Directed Elsewhere. We decided—OK, I decided—to see Borat. Although Mohammed had read mixed reviews, I knew that I’d get a laugh… once the endless stream of movie previews ended, if they ever ended, which they apparently never would. “The actor is Jewish, right?” Mohammed asked. I wasn’t touching that one with a 10-foot pole, not tonight. He then remarked pointedly that Kazakhstan, just a few hundred miles from where he grew up, was a very nice place and, incidentally, half Muslim. Why hadn’t I just agreed to Saw 3? Finally, Sacha Baron Cohen bumbled up onto the screen and into his much maligned and famously imaginary version of Kazakhstan. But how could I bust out with the belly laugh his hijinks so richly deserved? I was suddenly hyper-aware of Borat as a caricature of Muslim stereotypes—the anti-Jew thing, the anti-woman thing, the repressed-sexuality-combined-with-overwrought-machismo-unleashed-in-our-libertine-culture thing. At one point, Borat voices the disclaimer that “I am Kazakh, I follow The Eagle.” And the CIA Factbook confirms that 7 percent of Kazakhs do indeed classify their religion as “other.” Then the movie ends up back in Borat’s village, where he happily proclaims that “we no longer do the Running of the Jew, that’s cruel.” [Cut to scene of villager being amusingly crucified.] “We now do the Christians!” At least that one got a laugh out of Mohammed, who deserved it after sitting through the rest of the movie. But Mohammed never registered the iota of complaint, the ounce of politically correct self-righteousness, the opening that would have allowed me to justify those chuckles that did escape my imperfect self-restraint. He simply said that the movie wasn’t funny to him, at all. Not even the naked wrestling scene. I’d have to see it again, I decided, as the silence slowly suffocated our date. With someone who appreciated Cohen’s humor—for instance, almost anyone else in that rollicking, roaring theater. Someone who had never made the sorts of cultural missteps navigating American culture that Cohen was lampooning, someone who had never been stereotyped by peers, pals and potential lovers because of any famed intolerance in his own native land. Maybe my sister, she’d get a kick out of it. “You know, it was a long day at work,” Mohammed explained apologetically when he dropped me off. Something about failing computer networks and irritating bosses. “I guess I’m just tired.” And so we finished with chaste kiss, no sexytime, not for us, not tonight. Lucretia Blevins, though still single, has given up on Internet dating for the time being. This entry was posted in Revolution and tagged Craig Baxter, KS16, Lucretia Blevins. Bookmark the permalink.